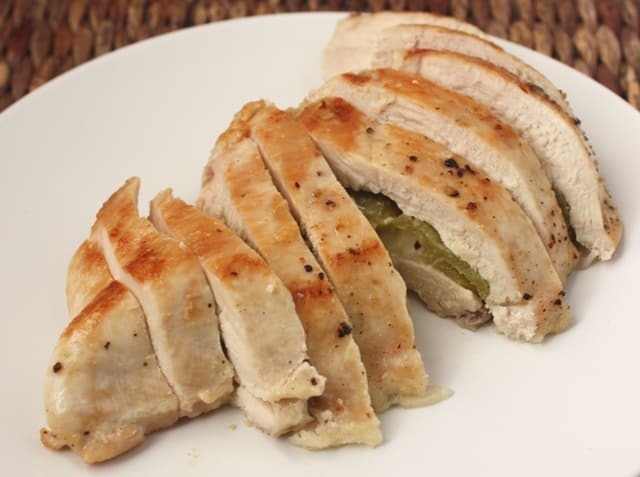 This is a very simple recipe that results in wonderfully flavorful chicken. I saw this at For the Love of Cooking a while back and I knew that I would be making it. I had forgotten about it until just the other day when I saw the green chile in my cupboard. This was the perfect use for it. My husband really enjoyed this and has already requested that I make it again. For a very simple recipe, this packs a fantastic flavor. Preheat the oven to 400 degrees. Cut a long slit in the sides of the chicken, almost completely through to the other side. Cut each slice of cheese into three long pieces and stack together. Tuck the stacked cheese into each green chile. 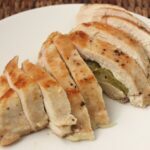 Stuff the green chiles into the chicken breasts. Close the slit with toothpicks. In an oven proof skillet, heat the oil over medium high heat. Place the chicken in the skillet and cook 3-4 minutes until golden brown on that side. Flip the chicken over and place the skillet into the pre-heated oven. Cook for 20 minutes, or until the chicken is cooked all the way through. Let the meat rest on the counter for 5 minutes prior to slicing. Slice thinly and serve while it is still warm and melting with cheese. Enjoy! This chicken looks so golden, melty and flavorful. I can't wait to try this recipe! This recipe sounds like it is right up my Hubs alley. Ohhh I LOVE the sound of this chicken! 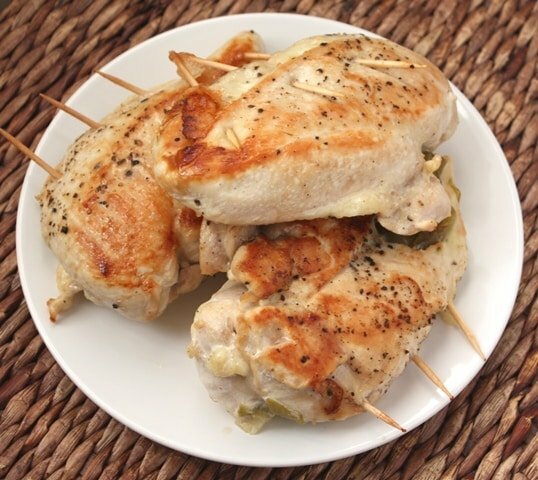 Green chilies, cheese and chicken! Yes please!! This chicken looks wonderful. This is something my husband and I would love. These chickens are very nicely cooked with the beautiful golden colour. Good to have a wonderful "surprise" with this delicious stuffing inside. I had forgotten about that one too! I need to try it. Love Pam's blog, it's ridiculously great, isn't it?